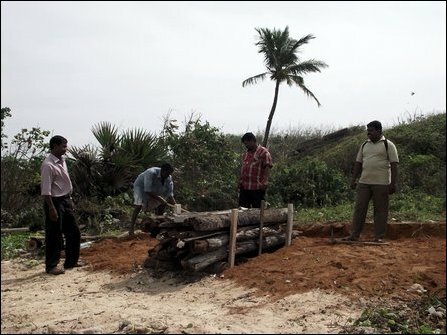 Resettled Tamils in the eastern part of Kaangkeasanthu'rai (KKS) on Tuesday staged a spontaneous protest against the Sri Lanka military demanding the right of the dead to be cremated in their own cremation ground. The protestors threatening to carry the casket of one of their relatives to the cremation ground blocked the main access route of the SL military, demanding the occupying army to open the route to the cemetery. Although the SL military blocked more than a hundred villagers, who attempted to take forward the casket to the cremation ground, the military hierarchy was forced to allow the villagers to reach the cremation ground through an alternative route as the protest lasted for more than 3 hours. The elected TNA members of the civic body in KKS joined the protest, which is described as first of its kind agitation in the SL occupied Jaffna. The protesting villagers were blocking the access route of southern tourists to KKS. They also blocked SL military vehicles. Earlier, when the matter of cemetery was brought to the SL military through Valikaamam North Piratheasa Chapai (PS) officials, who are elected representatives of the TNA, they were told by the military to approach their hierarchy through EPDP paramilitary leader and SL minister Douglas Devananda for the request to be considered. But, the villagers had declined the SL military offer calling it ‘cemetery politics’ by Mr. Devananda. Three deaths have occurred since the resettlement in the village. But, the dead were cremated in private land. The SL military was embarrassed by the civil protest on Tuesday, according to the journalists who were at the protest site. The president of the Valikaamam North PS, S. Sugirthan, told the journalists that the protest demanding the SL military to open the main access route to the cemetery would be stepped up. The SL military has opened only 3% of the High Security Zone for resettlement in the Jaffna peninsula.